On a clear night, you might be able to spot the red dwarf star Gliese 832 through a backyard telescope, as it is just 16 light years away. Today, astronomers announced the discovery of super-Earth planet orbiting this nearby star and say it might be the best candidate yet for habitable world. Gliese 832c is a “super-Earth” at least five times as massive as our planet, and it zips around its host star every 36 days. But that host star is a red dwarf that’s much dimmer and cooler than our sun, so Gliese 832c receives about as much stellar energy as Earth does, despite orbiting much closer to its parent, researchers said. ‘This makes Gliese 832 c one of the top three most Earth-like planets and the closest one to Earth of all three, a prime object for follow-up observations,’ said Abel Mendez Torres, director of the Planetary Habitability Laboratory at the University of Puerto Rico at Arecibo. However, other unknowns such as the bulk composition and atmosphere of the planet could make this world quite different to Earth and non-habitable, they warn. A team led by Robert Wittenmyer, of the University of New South Wales in Australia, discovered Gliese 832c by noticing the tiny wobbles the planet’s gravity induces in the motion of its host star. They spotted these wobbles in data gathered by three separate instruments — the University College London Echelle Spectrograph on the Anglo-Australian Telescope in Australia, the Carnegie Planet Finder Spectrograph on the Magellan II telescope in Chile and the High Accuracy Radial Velocity Planet Searcher (HARPS) spectrograph, which is part of the European Southern Observatory’s 11.8-foot (3.6 meters) telescope at the La Silla Observatory in Chile. Gliese 832c is the second planet to be discovered around the star Gliese 832. The other one, Gliese 832b, was found in 2009; it’s a gas giant that circles much farther out, taking about nine years to complete one orbit. 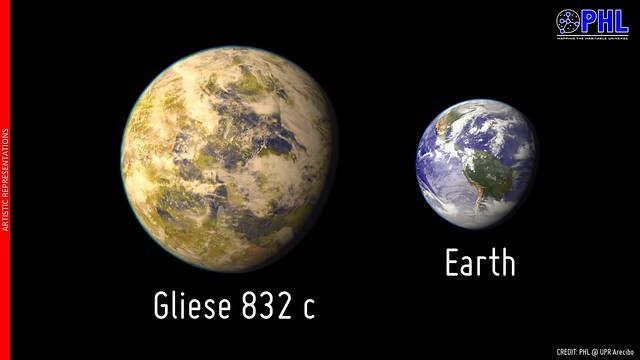 However, it’s unclear at the moment just how much Gliese 832c resembles Earth. Indeed, its discoverers think the newfound world may be more similar to scorching-hot Venus, with a thick atmosphere that has led to a runaway greenhouse effect.